Well, the party season is upon us. I’m not entirely sure what that means this year. However, people will always want a reason to have a snort or two and forget their troubles. So let’s concentrate on getting happy and getting dressed. With the current economic situation, you may not feel like investing in a new ball gown. That’s understandable. And a new suit or two may not be at the top of your priorities list. So I though that I would pull out a few looks from seasons past that I think can be updated to float you stylishly through fundraisers, dinners and houseparties in the country. As this post is becoming much longer than anticipated, I am splitting it up into several. Today, it’s women’s evening wear. Here’s one way to do it. 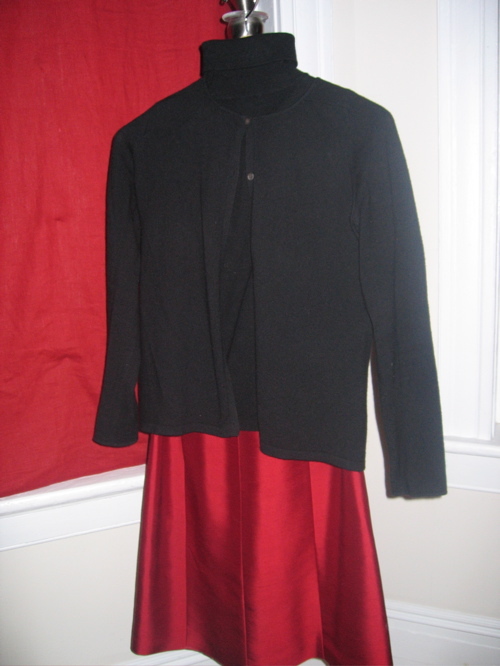 For those high holy evenings when you require more than a pair of slacks and less than your tiara, consider a cashmere twinset and satin or taffeta skirt. Remember that look from a decade ago? With the resurgence of updated retro looks, thanks to the success of “Mad Men”, this is the right look for our times. Update it, if need be, by losing the crinolines and trying a pencil or tulip skirt from a couple of seasons back. 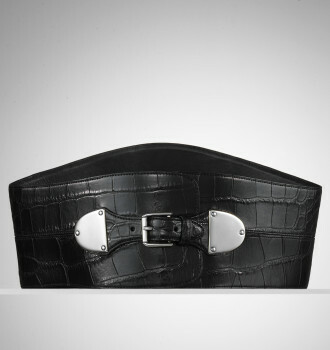 Alligator Wide Belt Ralph Lauren as before. Black cashmere and dark grey satin is always in style, increase dramatic impact with a splash of colour. 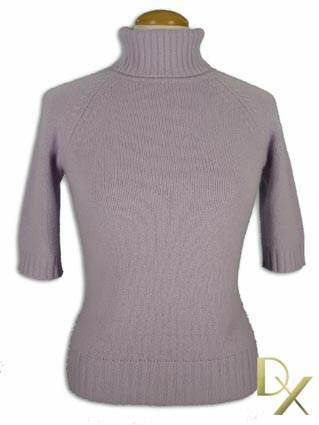 Try a lipstick red twinset over that same skirt or opt for a jewel tone purple turtleneck, which is all the rage this year. I trust you have beautiful black heels? They never go out of style. 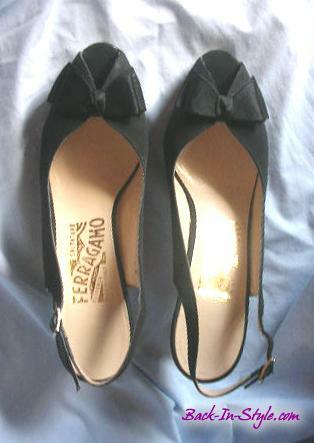 This entry was posted in Elegantology and tagged Ferragamo, Louboutin, Mikimoto, Saks, women's evening wear. Bookmark the permalink. Bravo! Well done – there will be a lot of repurposing at the dream house this year. 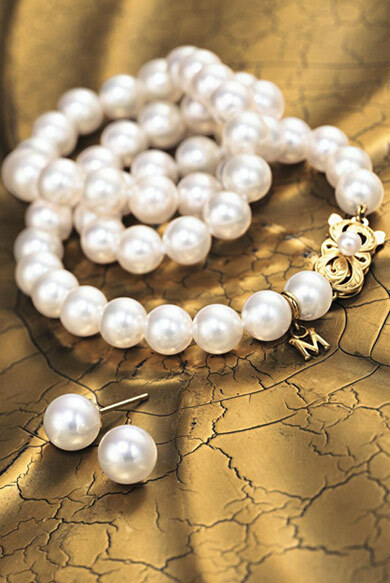 Agree with you on the pearls, my wife has helped develop my appreciation over the years, an appreciation that was started in her by her grandmother. They’re also a great gift in a down market, really lovely, salt water pearl earrings are much more affordable than one might think and can be had in a never ending selection of shapes and sizes. My wife has taken to wearing one black and one white on occasion, which always draws a compliment. My mother always said, a girl always looks fresh with pearls! I also love the crisp, freshly pressed white cotton shirt and pearls. I’m late seeing this article, but I really love what you post and this idea is still valid in 2010 with the economy the way it is…thanks! Thanks CJ! Style is timeless and always a good investment.